The Stewards of the Future conference series was jointly created by the College of Agriculture and Life Sciences (CALS) and the NC Agricultural and Life Sciences Research Foundation in 2012 to showcase college innovation and research on the pressing issues of our time, as well as to connect stakeholders with our scientists to help solve global grand challenges. 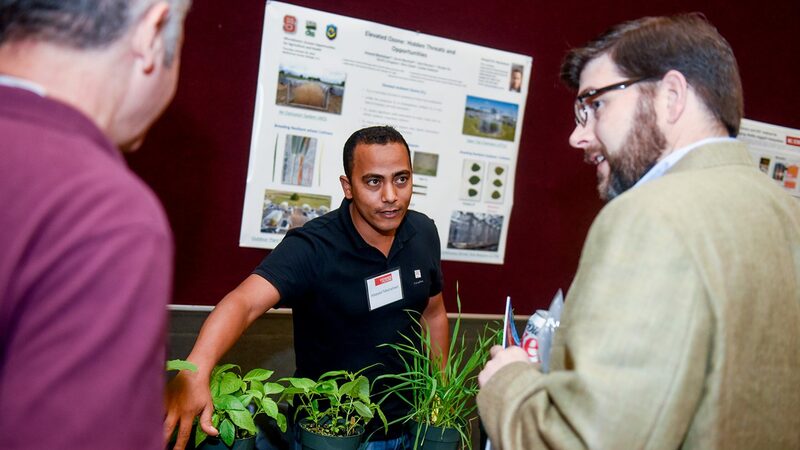 In addition to keynote addresses by speakers of international reputation, conference staples include opportunities to highlight NC State research. Below are details about our previous Stewards of the Future events. This College of Agriculture and Life Sciences conference provided international, national and state level perspectives on issues of water quantity and quality. Participants explored how North Carolina and its global partners can provide leadership toward the goal of ensuring water resiliency for North Carolina and a growing world. CALS and the North Carolina Biotechnology Center’s AgBiotech Initiative combined their signature events for this two-day conference. The event engaged the agriculture and biotechnology communities to address key topics such as research innovation, technology commercialization, regulation, policy, public acceptance, agricultural production and ag biotech products. Experts discussed challenges and opportunities related to bringing products to market while ensuring a safe and abundant food supply for a growing world. Nobel Laureate and distinguished MIT professor Dr. Phillip A. Sharp and Juan Enriquez, best-selling author and leading authority on the global impact of life sciences, headlined this conference that focused on the importance of research in addressing society’s challenges, particularly within the context of human health and global sustainability. In addition to these keynote addresses, conference highlights included a panel discussion with corporate and public sector leaders and an Innovation Fair showcasing examples of and opportunities for research collaboration.